Biological and agricultural engineering Ph.D student Lise Montefiore works in Natalie Nelson’s Biosystems Analytics Lab to use tools within data analytics to identify which estuarine ecosystems are most vulnerable to global and local change. Before coming to NC State, she received her master’s degree in water science engineering from Polytech Montpellier, in Montpellier, France. She has worked as an intern at several consulting firms specialized in water resource management and hydraulic modeling. She transferred to NC State from Oklahoma State University where she worked on additives in bioretention systems and phosphorous removal by fly-ash. 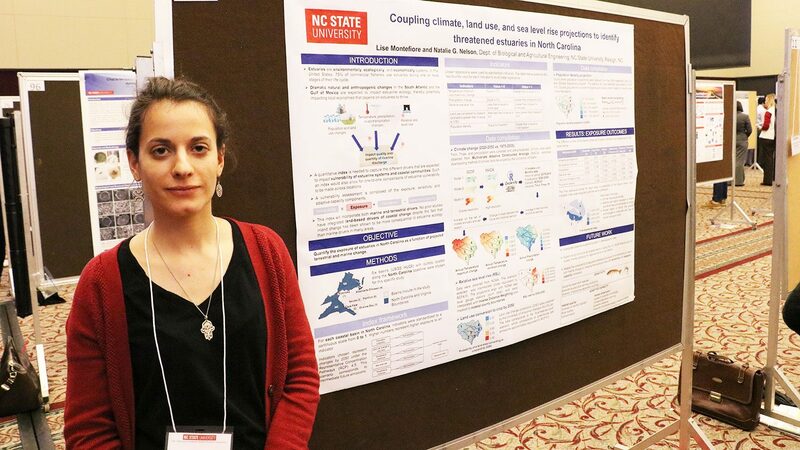 Read on to learn more about her research here at NC State and where the future may take her. I chose to do my Ph.D. in the Biological and Agricultural Engineering (BAE) department at NC State because this department gathers interdisciplinary fields. 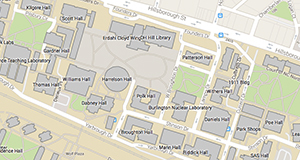 The different labs developed by faculty within BAE are complementary and contribute to the dynamics of the department, leading to novel and relevant research. I believe that learning from other perspectives is fundamental to solving and understand complex environmental issues and is extremely valuable from a personal and professional training. Currently, I am quantifying vulnerability across the Southeast United States as a function of projected water quality change in estuaries. This interdisciplinary study leverages land use, climate and demographic datasets, among others. The final goal of this study is to create a vulnerability index that incorporates natural (e.g., changing precipitation, sea level) and anthropogenic (e.g., land use) stressors. Results of this analysis will identify areas that are at greater risk of water quality degradation that can impact estuarine ecosystems and thereby local economies. Why did you think it was important to share your research in the graduate student symposium? I think it was important to participate in the graduate symposium because it is a way to present your research to others. By presenting a poster, it is a straightforward way to interact with people who come from different fields in a nonconventional manner. Some students who visited my poster were interested in results obtained for their own research. Moreover, during discussions with other students, I got some relevant suggestions that I might include to improve my research. And by visiting other posters, I discovered some other tools that might be useful in my future research. There was a very enjoyable synergy during this event. To be nominated with 2nd place in the competition confirmed that my research was in the proper direction and encouraged me to continue in this way. Ideally, after graduation, I would like to pursue a research career in academia or a governmental agency. I am also looking for a place where there will be international collaborations. It is critical to learn and collaborate with different laboratories and agencies around the world that can bring about progress and creativity in research. In my research, I enjoy learning new skills. My research is an interdisciplinary and broad study which requires learning from computing science to environmental and socio-economic science. This aspect is very rewarding from a personal perspective. After graduation, I would like to continue working with the dynamic and the collaborative spirit I experienced at NC State.